Carlos Alvarado, 38, has had his inauguration as the Americas’ youngest head of state, coming to power in Costa Rica. Standard-bearer of an ambitious platform aiming at slashing corruption, government costs, poverty and unemployment, the journalist and author stands out for his dedication to decarbonization and a completely green energy grid. His new cabinet, by the way, has 14 women and 11 men. He said that he wants his government to have a plan for moving toward a completely renewables-based society within six months. In the past he has tied this goal to Costa Rica’s tradition of progressive exceptionalism, in not having a national army (this country’s exceptionalism is somewhat different from that of the United States, let us say). Alvarado arrived at his inauguration in a hydrogen-powered bus. Costa Rica is well on its way to having a completely green electricity grid. Some 78% of its electricity comes from hydro, and wind and geothermal provide 10% each. Costa Rica has a vast untapped solar potential, since less than 1% of its electricity currently comes from photovoltaic cells. The government has invested heavily in making sure electricity from these sources can be efficiently transported to cities where it is needed. Costa Rica benefits from the stabilizing effect of hydroelectric power, which serves as a baseline source when wind fluctuates. In the UK and other countries without big hydroelectric potential, that role still has to be played by natural gas (nuclear plants cannot be scaled up and down quickly enough to play this role). The country hopes to have a completely green electricity grid by 2021, less than three years from now. The big carbon-producing sectors Costa Rica needs to improve on are transportation, construction and agriculture. Even the former government had announced a goal of 37,000 electric vehicles by 2023, some 2.6% of the fleet of 1.4 mn. automobiles in the country of 5 million. Alvarado will want to move more quickly and ambitiously than that. Even before his inauguration, the Costa Rica Institute of Electricity announced the purchase for $3.5 mn. of 100 Hyundai electric sedans, as part of a demonstration project urging government institutions and private business to go to EVs. Costa Rica is a small country and cannot by itself make much of a dent in global heating, which is caused by human burning of coal, petroleum and gas. But by setting a realistic goal of going 100% green, it makes itself a model and a demonstration project for the rest of the world. Alvarado’s message: it can be done. 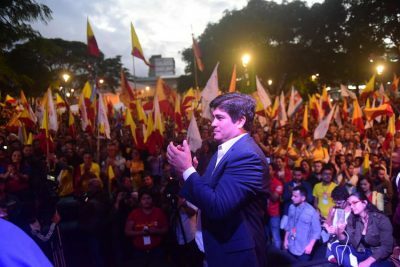 Alvarado faces enormous challenges in implementing his reforms, since he heads a minority government (parliament is divided by six parties) and a powerful Evangelical party opposes many of his initiatives.